Rubik's Cube - Ritendra Datta, Ph.D. I tried out solving the Rubik's Cube as a passing hobby over short patches of time in the past. It turned out to be not so scary with the right resource at my disposal. By resource I meant the simple tutorial for a layer-wise solution, by Professor J. Bowen. All my attempts have, in the past, been limited to this approach alone. Of course, layered approaches are not recommended for speed cubing (30 seconds or less) by world-champions like Lars Petrus, who by the way has made available online his corner building approach for speed. Although I am no authority whatsoever in this matter, for the beginner I would still recommend the layered approach (tutorial link above) to start with, simply because I found it to be quite logical and easy to pick up. Once I figured out the approach, my solving speed kept going up over subsequent trials. 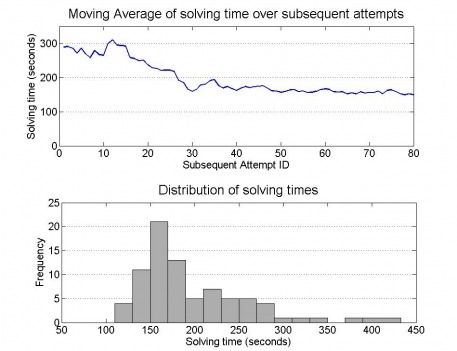 I went so far as to record (*blushes*) the solving times, and generated a couple of graphs on my performance. And here goes a video of me solving the cube in about 2 minues (122 seconds). The cube is not in the best of shapes, it is not lubricated, so you can see me struggling. The experts recommend lubricating the cube with silicone spray in order to gain speed. There are actually some wonderfully smart video tutorials by other people that one can follow in order to learn (Part1, Part 2). I actually don't know (and I don't think the answer is obvious) which is the best method to learn, text-based tutorials, video tutorials, or having someone teach you in person.